And we’re off! Our day began at 7:00AM in St Marys where we packed the buses with all our belongings and it was evident the pre road trip excitement and nerves were in full swing. Once we boarded the buses we wasted no time, jumping straight into games like “2 truths and a Lie”, the Minty wrapper game and of course, Mafia! We travelled for 2 hours before reaching our first stop, Capertree. We had some morning tea here and quickly caught up as a group on the playground equipment before we hit the road again, this time headed towards Dubbo for some lunch and to pick up our cook, Nathanael. During this time we had our first reflection as a group on the Currency Kids. Once we reached Dubbo, we all sat together for a bite to eat and filled one another in on what each bus had been up to so far. There was definitely no shortage of fun on either bus with lots of laughter and relationship building happening already! After lunch, we departed for our final stop of the day, Nyngan. 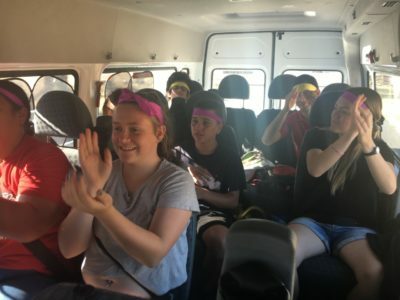 Both buses were certainly affected by the inevitable post-lunch slump, so there was only one obvious option to get the groups excited again… BUS AEROBICS!! Once some seriously impressive dance moves had been put forth the atmosphere was sky high and everyone had a huge smile on their face. The two-hour trip flew by while we occupied ourselves with bracelet making, “would you rather” questions, singing, chatting and more. At 4:00PM we arrived in Nyngan, unpacked our buses, placed our belongings in our cabins and headed outside for some icebreaker games to pass the time before dinner. It’s so great to see the trip impacting people already. 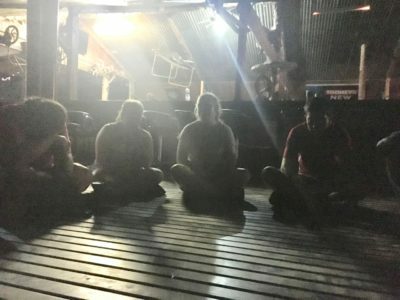 Just before bed the group had a visit from special guest, “Yayme” who lead a meditation session with the group to set a calm tone and to prepare everyone for bedtime. There was a lot of laughter during the session and not much meditation, but the whole group had a great time none the less. Everyone was wrapped up in bed by 10:00PM, ready for a good nights sleep and what tomorrow has to offer.